South Carolina officer Ben Fields fired for throwing Spring Valley HS female student. Richland County Sheriff Leon Lott at today’s press conference. 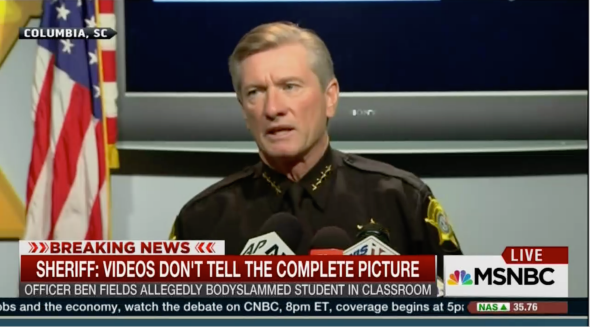 South Carolina sheriff’s deputy and school resource officer Ben Fields has been fired for throwing a female student across a classroom while arresting her on Monday, Richland County Sheriff Leon Lott said at a press conference Wednesday. Fields’ actions were videotaped by multiple students; classmates have told reporters that the student in question had refused to leave her desk after being told to do so by a teacher and an administrator attempting to discipline her for using her cellphone. Once he put his hands on her—he was allowed to do that. He placed her under arrest and verbally told her she was under arrest. He attempted to use force to make the arrest. I do not feel that the proper procedures were used at that point. And that’s—that’s what has caused me heartburn and what my issues are with this. The maneuver that he used was not based on training, or acceptable. Our training unit looked at it, they examined it … Their recommendation to me was that Deputy Fields did not follow proper training, did not follow proper procedure when he threw the student across the room. From the very beginning, that’s what has caused me to be upset. When I first saw that video and continues to upset me when I see that video is the fact that he picked a student up and threw the student across the room. That is not a proper technique and should not be used in law enforcement. And based on that, that is a violation of our policy, and approximately 20 minutes ago school resource officer Ben Fields was terminated from the Richland County sheriff’s department. As has been reported previously, the FBI and the U.S. attorney’s office are investigating the incident to determine whether any criminal behavior or civil rights violation occurred.